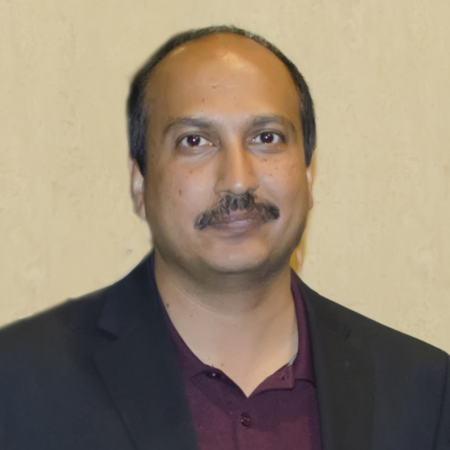 Dr. Gowda serves as a supervisory soil scientist for the Forage and Livestock Production Research Unit at the USDA-ARS Grazinglands Research Laboratory El Reno, OK. He conducts research in forage and rangeland management, remote sensing, water resources management, and greenhouse gas emissions in the Southern Great Plains. Specific research areas include, but are not limited to: greenhouse gas monitoring and modeling, regional evapotranspiration (ET) mapping, eddy covariance, and hydrologic and crop modeling. Current research projects include crop modeling with DSSAT, development of UAV remote sensing based grazing management tools, developing and managing a network of greenhouse measurement systems, ET-SWAT-MODFLOW linkage for groundwater management, development and evaluation of remote sensing based surface energy balance models, energy balance closure problem with eddy covariance systems, development of ET mapping and reference ET software for operational ET remote sensing programs and irrigation scheduling, calibration and validation of hydrologic and crop models and revising their irrigation and yield estimation algorithms, and application of ET, hydrologic and crop models for developing and evaluating agricultural management practices that are resilient to climate extremes. Gowda, P.H., R.L. Baumhardt, A.M. Esparza, T.H. Marek, and T.A. Howell. 2007. Suitability of cotton as an alternative crop in the Ogallala Aquifer Region. Agronomy Journal, 99:1397-1403. Hernandez, J.E., P.H. Gowda, T.A. Howell, J.L. Steiner, F. Mojarro, E.P. Nunez, and J.R. Avila. 2012. Modeling groundwater levels in the Calera aquifer region in central Mexico using MODFLOW. Journal of Agricultural Science and Technology B 2:52-61. Porter, D.O., P.H. Gowda, T.H. Marek, T.A. Howell, S. Irmak, and J. Moorhead. 2012. Sensitivity of grass and alfalfa reference evapotranspiration to sensor accuracy. Applied Engineering in Agriculture, 28(4):543-549. Hernandez, J.E., P.H. Gowda, T.A. Howell, T.H. Marek, and W. Ha. 2013. Groundwater levels in northern High Plains: Baseline for existing agricultural management practices. Texas Water Journal, 4(1):22-34.
parameterization for the SSEB approach. Journal of the American Water Resources Association, 49(3):577-591. Paul, G., P.H. Gowda, P.V. Vara Prasad, T.A. Howell, S.A. Staggenborg, and C.M.U. Neale. 2013. A comprehensive evaluation of SEBAL using high resolution airborne imagery from BEAREX08. Advances in Water Resources, 59:157-168. Guzman, J.A., D.N. Moriasi, M.L. Chu, P.J. Starks, J.L. Steiner, and P.H. Gowda. 2013. Mapping and spatiotemporal analysis tool for hydrological data: SPELLMAP. Environmental Modeling and Software, 48:163-170. Anandhi, A., S. Perumal. P.H. Gowda, A. Lamsal, S. Hutchinson, J. Harrington, P. Tomlinson, M.B. Kirkham, and C.W. Rice. 2013. Long term spatial and temporal trends in frost day indices in Kansas, USA. Climate Change, 120:169-181. Gowda, P.H., T.A. Howell, G. Paul, P.D. Colaizzi, T.H. Marek, and B. Su. 2013. Deriving hourly evapotranspiration with SEBS: A lysimetric evaluation. Vadose Zone Journal, 12(3):1-11. Hubbard, K., B. Kamble, A. Killic, and P.H. Gowda. 2013. Irrigation scheduling using remote sensing data assimilation approach. Advances in Remote Sensing, 2:258-268. Moorhead, J.E., P.H. Gowda, D.O. Porter, T.H. Marek, and T.A. Howell. 2013. Evaluation of statistical relationships between crop-specific SPEI and irrigation demand in the Texas High Plains. Applied Engineering in Agriculture, 29(6):905-916. Marek, G.W., P.H. Gowda, S.R. Evett, T.A. Howell, R.L. Baumhardt, and K.S. Copeland. 2014. Post-processing techniques for reducing errors in weighing lysimeter evapotranspiration (ET) datasets. Transactions of the ASABE, 57(2):499-515. Holman, D., M. Sridharan, P.H. Gowda, D.O. Porter, T.H. Marek, T.A. Howell, and J.E. Moorhead. 2014. Gaussian process predictive models for reference ET estimation from alternative meteorological data sources. Journal of Hydrology, 517(19):28-35. Baumhardt, R.L., S.A. Mauget, P.H. Gowda, and D.K. Brauer. 2014. Modeling cotton lint yield response to irrigation management as influenced by El Nino-southern oscillation. Agronomy Journal, 106(5):1-10. Moorhead, J.E., P.H. Gowda, D.O. Porter, T.H. Marek, V.P. Singh, T.A. Howell, and B.A. Stewart. 2015. Identifying and evaluating a suitable index for agricultural drought monitoring in semiarid regions. Journal of the American Water Resources Association, 51(3): 807-820. Brauer, D., R.L. Baumhardt, D. Gitz, P.H. Gowda, and J. Mahan. 2015. Characterization of trends in reservoir storage, streamflow and precipitation in the Canadian River watershed in New Mexico and Texas. Lake and Reservoir Management, 31:64-79. Moorhead, J.E., P.H. Gowda, T.M. Hobbins, G.B. Senay, G. Paul, T.H. Marek, and D.O. Porter. 2015. Accuracy assessment of NOAA gridded daily reference evapotranspiration for the Texas High Plains. Journal of the American Water Resources Association, 51(5):1262-1271. Baumhardt, R.L., S.A. Mauget, P.H. Gowda, D.K. Brauer, and G.W. Marek. 2015. Optimizing cotton irrigation strategies as influenced by El Nino southern oscillation. Agronomy Journal, 107(5):1895-1904. Hernandez, J.E., P.H. Gowda, T.A. Howell, T.H. Marek, W. Ha, and L.K. Almas. 2015. Implications of 3 alternative management policies for Ogallala Aquifer sustainability in the Texas High Plains, Texas Water Journal, 6(1):86-102. Guzman, J.A., D.N. Moriasi, P.H. Gowda, J.L. Steiner, P.J. Starks, J.G. Arnold, and R. Srinivasan.2015. A model integration framework for linking SWAT and MODFLOW. Environmental Modelling & Software, 73:103-116. Gowda, P.H., P.V. Varaprasad, S.V. Angadi, T.A. Howell, U.M. Rangappa, and P. Wagle. 2015. Finger Millet: An alternative crop for the Southern High Plains. American Journal of Plant Sciences, 6:2686-2691.
precipitation under bare soil conditions using large weighing lysimeters. Agricultural Water Management, 169:115-128. Colaizzi, P.D., N. Agam, J.A. Tolk, S.R. Evett, T.A. Howell, S.A. O’Shaughnessy, P.H. Gowda, W.P. Kustas, and M.C. Anderson. 2016. Advances in the two-source energy model: Partitioning of evapotranspiration and transpiration for cotton. Transactions of the ASABE, 59(1):181-197. Angadi, S.V. P.H. Gowda, H.W. Cutforth, and J. Idowu. 2016. Circles of live buffer strips in a center pivot to improve multiple ecosystem services and sustainability of irrigated agriculture in the Southern Great Plains. Journal of Soil and Water Conservation, 71(2):44A-49A. Angadi, S.V., M.R. Umesh, F.E. Contreras-Govea, K. Annadurai, S.B. Begna, M.A. Marsalis, N.A. Cole P.H. Gowda, R. Hagevoort, and L.M. Lauriault. 2016. In search of annual legumes to improve forage sorghum yield and nutritive value in the Southern High Plains. Crop, Forage & Turfgrass Management, 2(1):1-5. Marek, G.W., P.H. Gowda, S.R. Evett, R.L. Baumhardt, D.K. Brauer, T.A. Howell, T.H. Marek, and R. Srinivasan. 2016. Predicting ET for dryland cropping systems in the semiarid Texas High Plains using SWAT. Journal of the American Water Resources Association, 52(2):298-314. Ajayi, S., S.K. Reddy, P.H. Gowda, Q. Xue, J. Rudd, P. Gautham, S. Liu, C. Biradar, and K. Jessup. 2016. Use of Spectral Reflectance for Estimating Plant Parameters of Winter Wheat Genotypes in the Texas High Plains. Journal of Crop Improvement, 30(2):176-195. Moorhead, J.E., P.H. Gowda, D.O. Porter, T.H. Marek, and G.W. Marek. 2016. Spatial variability in sensitivity coefficient of reference ET in the Texas High Plains, Applied Engineering in Agriculture, 32(2):263-269. Invited. Marek, G.W., P.H. Gowda, S.R. Evett, R.L. Baumhardt, D.K. Brauer, T.A. Howell, T.H. Marek, and R. Srinivasan. 2016. Calibration and validation of the SWAT model for predicting daily ET over irrigated crops in the Texas High Plains using lysimetric data. Transactions of the ASABE, 59(2)611-622. Invited. Gowda, P.H., T.A. Howell, R.L. Baumhardt, D.O. Porter, and T.H. Marek. 2016. A user-friendly interactive tool for estimating reference ET with ASCE standardized Penman-Monteith equation. Applied Engineering in Agriculture, 32(3):383-390. Anapalli, S.S., L.R. Ahuja, P.H. Gowda, L. Ma, G. Marek, S.R. Evett, and T.A. Howell. 2016. Simulation of crop evapotranspiration and crop coefficients with data in weighing lysimeters. Agricultural Water Management, 177:274-283. Araya, A., I. Kisekka, and P.H. Gowda. 2016. Evaluation of water-limited cropping systems in western Kansas using DSSAT-CSM. Agricultural Water Management, 150:86-98.